The All Progressives Congress, APC, has condemned the Oba of Lagos, Rilwan Akiolu and distanced itself from the hate speech made by him that anyone that refuses to vote for APC governorship candidate in Lagos, Akin Ambode, will die in the Lagoon within seven days. 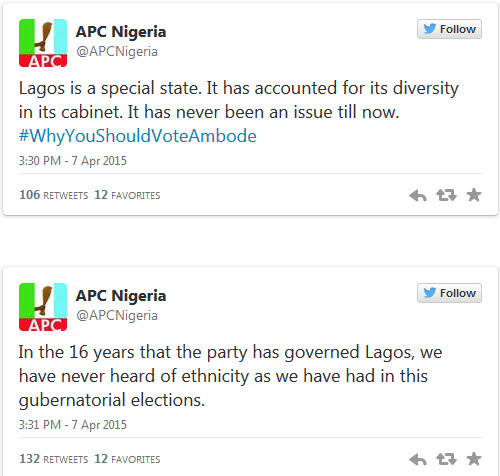 The party made this known via its Twitter handle, @APCNigeria. 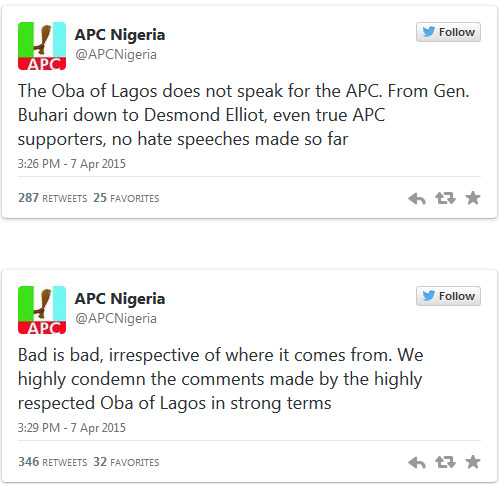 The party has refused to make comment on the incident since the news broke on Sunday and was promoting #WhyYouShouldVoteAmbode on its twitter handle but realizing the public outcry and allegation that Akiolu spoke the mind of the leadership of the party, it was forced to make the clarification before resuming the promotion.